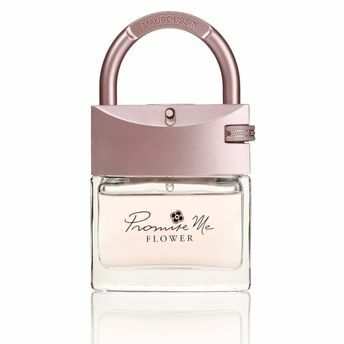 Mauboussin Promise Me Flower Eau De Parfum signifies a promise of strength, with an intense scent trail. Promise Me gives a new spirit to the theme of eternal and passionate love. The beautiful design of the flacon is a padlock that is decorated with ring that is adorned with several crystals. About the Brand: The legendary Maison Mauboussin was founded in Paris in 1827. Every historical aspect counts its legacy; from political to social events, marking every era in the development of Mauboussin as a French jeweller. Always at the forefront of forging elegance, Mauboussin reinterprets fashion demeanour in jewelry to this present world in the most contemporary form, where jewels such as rings, bracelets, necklaces, earrings and watches take position of great prominence. From bridal collections, with diamond jewelry, engagement rings and wedding bands, to statement pieces with coloured gems and watches from dressy to sport, Mauboussin presents a wide array of fine jewelry, luxury and fashionable accessories.